The Law Offices of David A. 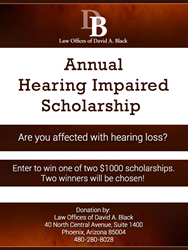 Black in Phoenix has announced an annual scholarship program for the benefit of those who are hearing impaired. There will be two $1,000 tuition scholarships awarded annually designed to assist deaf and hearing impaired students in continuing their education. Phoenix criminal defense attorney David A. Black and his law firm, the Law Offices of David A. Black, have announced a new scholarship program for the benefit of deaf and hearing impaired individuals who would like to continue their education. The program consists of two $1,000 scholarships each year, and will be paid on behalf of the successful applicant in the form of tuition to the educational institution which the individual will be attending. The program has been launched in an effort to assist deaf and hearing impaired individuals, many of whom have encountered difficulties in the academic arena. The effort is designed to provide assistance for those individuals who would like to continue their education. Those who wish to apply, or who would like to learn more about the program, should visit the firm’s website. Candidates need not currently be enrolled in school in order to apply. Qualifying educational institutions include secondary schools, colleges, junior colleges, and trade schools. The deadline for this year’s application is November 8, 2016.